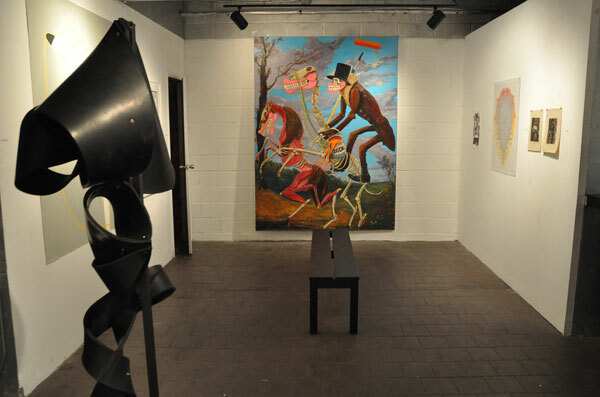 Yesterday, I convinced Brookyn curators Ali Ha and Jason Andrew to give me a peak at the Surrealism: Twenty Artists from the Neighborhood Wrestle Their Unconscious show that opens today at Factory Fresh as part of the 2011 Bushwick Open Studios. This exhibition does something I wish would happen more in Bushwick — and throughout the city — which is bring together work from various scenes and explore ideas that unify them. Today, Factory Fresh is celebrating its third anniversary. 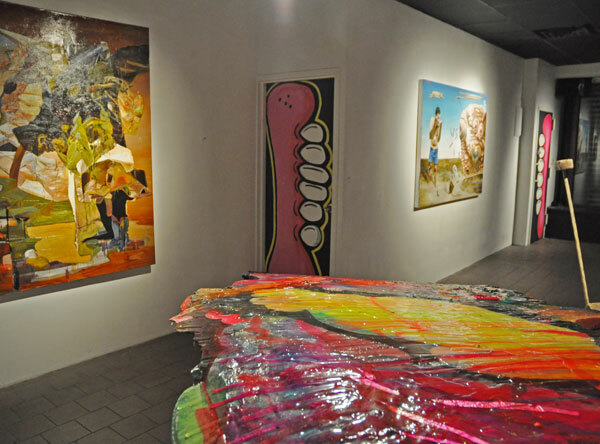 Since it has opened, the gallery has been associated with the street art world, carving its place out as a major stop on the global street art circuit. Ali Ha is one of the founders of the rambunctious gallery and she brings to this exhibition her eye for out-of-the-mainstream work that flirts with pop culture while always trying to speak to a mass audience. 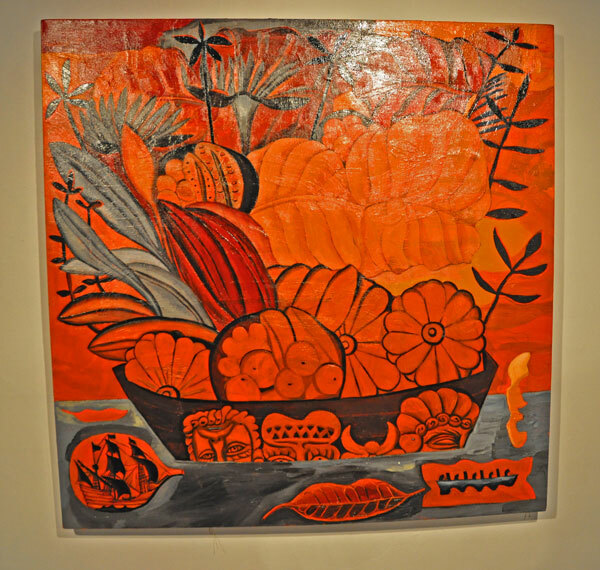 Her co-curator Jason Andrew of Norte Maar and Storefront Gallery has his own deep roots into a whole different aspect of the local art scene and he brings to this show his extensive experience in curation and excellent relationships with local artists. Together, they’ve been able to create an energetic show that lassos diverse talents who are delving into aspects of personal consciousness in a deep and probing way. Ben Godward, a neighborhood staple and favorite, has provided a large urethane foam and resin work that has become his signature style. Titled “Lugubrious Lover Laid Bare” (2011), his work visually sticks in your eye with its wonky composition and collision of poured materials and office furniture-like pedestal. 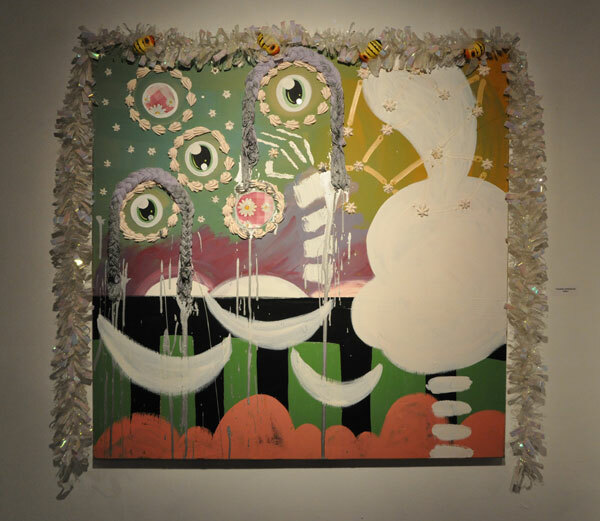 Nearby, Tamara Gozalez’s “Elfen” (2008) is framed by tinsel and surfaced with icing-like paint. The biomorphic shapes and her colors look fresh and inviting. The work is placed next to a smaller work by Skewville and if the pairing sounds unlikely, it reveals a common interest in flat forms and a desire to push the painting all the way to the edge. They both seem conscious of their borders, and each artist uses different framing devices to unify their compositions. In the backroom gallery, Sweet Toof’s large “Hold Your Horse” (2011) dominates the room, along with Tyrome Tripoli’s “Rubber Fan, Exhaust” (2007) and two carved works by Kevin Curran. These four works represent a darker side to the unconscious and a stark contrast to the airy dream worlds in the front gallery. Sweet Toof’s reimagining of compositions from art history with the gummy absurdity of his moniker conveys a nightmare-like discomfort. Tripoli’s dark totem feels foreboding like a shadow that is incapable of stepping into the light. 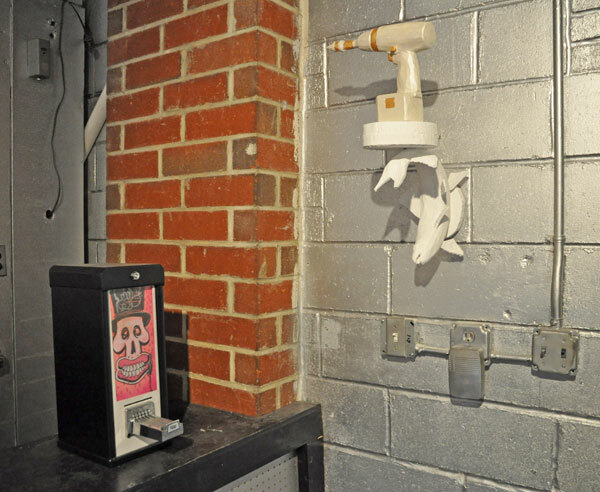 It is well placed near Anders Bergstrom’s “Microphone Cluster” (2009) print, which shares its mysterious sense of discomfort and space. Curran’s foam works feel like fairy tales and, like the original stories by the Brother’s Grimm, they have a dark side that accompanies their playfulness and suggests a deeper threat outside the frame. 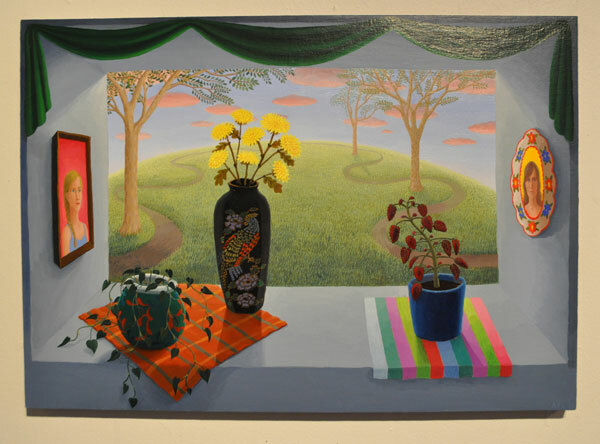 Amy Lincoln’s sunny, almost Renaissance-like composition, “Plants, Pictures & Distant View” (2011), would look very different in another context but here you become very aware that a deep ledge separates you from the idyllic world in the distance. The beautiful landscape beyond is dotted with pinkish UFO-like clouds and winding paths that disappear at the horizon. You look for meaning in the objects on the window sill but there’s no obvious narrative. Framing is a common thread in most of these works and in the case of Paul D’Agostino’s contribition, they disappear all together, preferring to cluster on the wall in various ways and feeling more like a scrapbook of memories and ideas than a story. Some did confuse me, like Andrew Hurst’s “Suite of Dances” (2011), which seemed too related to Robert Rauschenberg to not be some sort of commentary (though there were no clues of dialogue), and Kevin Regan’s “Untitled” (2011), which appeared very distracting because of its lack of framing and the way it lifted from the wall. I’ll have to go back today to delve deeper into the swamps of unconscious at work in each piece. I don’t know if there was a strong unity to all the work but it is nice to see that a scrappy art scene continues to dream. Ben Godward's "Lugubrious Lover Laid Bare" (2011) with (left to right) Tamara Gozalez's "Elfen" (2008), Skewville's "Step Off" (2011) and Francesco Longnecker's "Darkling" (2011). Sweet Toof's "Hold Your Horses" (2011) in the background with Tyrome Tripoli's "Rubber Fan, Exhaust" (2007) in the foreground. 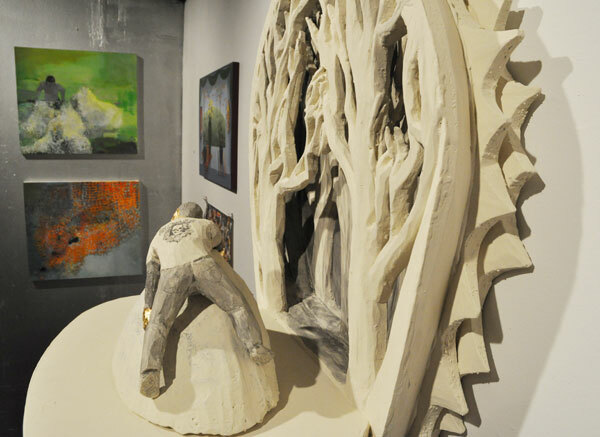 Norman Jabaut's "Spiritus" (2010) sculpture with Ryan Michael Ford's "Me VS Myself" (2011) painting. Kevin Curran's "The Woods" (2011) with works by Rebecca Litt in the backgroud. 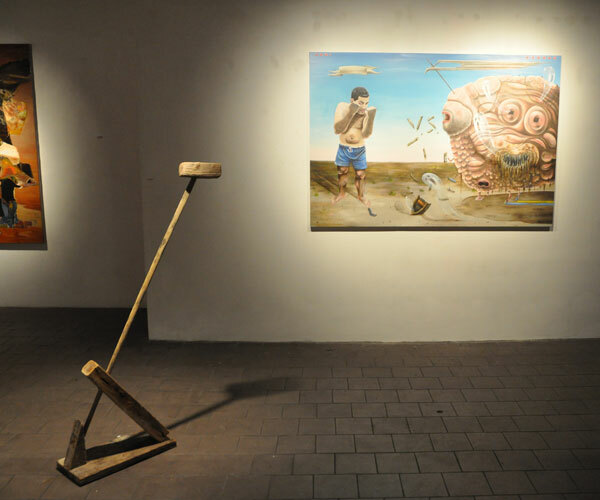 Surrealism: Twenty Artists from the Neighborhood Wrestle Their Unconscious continues at Factory Fresh (1053 Flushing Avenue, Bushwick, Brooklyn) until June 26. Today, Saturday, June 3, Factory will also be celebrating its Third Anniversary with a party from 1-7pm, which will feature a one-day pop-up sculpture park next to the gallery.